As sinfully gorgeous Devlin Sinclair helps her retrieve her most intimate purchases, Gabrielle knows she's in trouble. His suggestive smile and dark smoldering gaze leave no doubt that he'd be happy to deliver on her long-resisted fantasies. None of which she can afford to indulge. Not now. Not with him. Devlin Sinclair is an attorney with ambition to match her own, and the new obstacle in her path to partner. Avoiding him is not an option, but sharing a case--at the insistence of her boss--is flirting with danger. Devlin makes her forget everything except the feel of his hands on her. 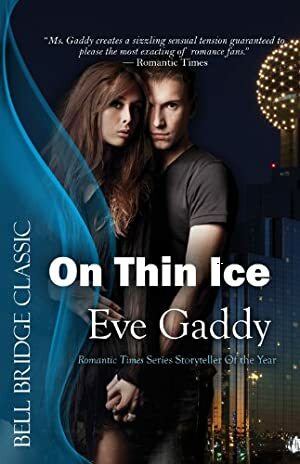 ON THIN ICE is sensual, sultry romance at its best--as only Eve Gaddy can deliver. Track It. This book has been $1.97 within the past year. Log In to track Eve Gaddy on eReaderIQ. to be notified each time the price drops on any book by Eve Gaddy. to stop tracking Eve Gaddy. The price of this book has changed 56 times in the past 2,643 days. The current price of this book is $2.47 last checked 15 hours ago. This lowest price this book has been offered at in the past 90 days is $2.42. This lowest price this book has been offered at in the past six months is $2.04. This lowest price this book has been offered at in the past year is $1.97. The lowest price to date was FREE last reached on December 23, 2012. The highest price to date was $4.99 last reached on September 27, 2013. We last verified the price of this book about 15 hours ago. At that time, the price was $2.47. This price is subject to change. The price displayed on the Amazon.com website at the time of purchase is the price you will pay for this book. Please confirm the price before making any purchases.